One of the many great things about compost is that you can pretty much make it out of stuff you already have on hand. The average household and its surroundings produce plenty of ingredients to go into a pile and, with additions of water and air, those ingredients can be made into compost. It’s like entering a contest that assures you “no purchase necessary to win” and winning — without spending a dime! While it’s certainly possible to buy things to use in your composting projects, part of the creativity of compost-making is its trash-to-treasure aspect. Everything that goes into the bin — and often the bin itself — may be material that was otherwise destined for the garbage dumpster and, ultimately, the landfill. For example, your bin made from repurposed wooden shipping pallets and lined with flattened cardboard boxes can be filled with grass clippings, dried leaves, weeds, spent plants, and kitchen scraps. You can turn and chop the contents with tools you probably already own, and for nothing more than the cost of your labor, you can produce soil-satisfying compost to nourish your gardens. Recently, a new angle on the “no purchase necessary” game has arisen. Some manufacturers are delivering their goods in compostable packaging, so items that used to wind up in the waste stream can now be diverted and converted into compost. When you do make a purchase, some of the environmental impact is mitigated by your ability to compost the packaging instead of throwing it away. My first encounter with made-to-decompose packaging was about a year ago, when I bought a pair of sandals displayed on a cornstarch plastic hanger that was labeled as 100 percent biodegradable. When I got my purchase home, I took the hanger and tied it to a length of twine before I buried it in the center of my “mostly coffee grounds and yard wastes” bin. My plan was to use the twine to retrieve the hanger and check its state of decomposition after a few months. Unfortunately, the twine itself proved rather rapidly biodegradable, and the hanger is irretrievably lost in the depths of the bin. Next time: nylon cord! Since then, I’ve purchased eggs in a compostable carton. Talk about a low-impact purchase — we’ll eat the eggs and compost both the carton and the shells. And perhaps most famously, Frito-Lay, Inc., now sells its SunChips in widely advertised compostable bags. I’ve always liked SunChips, but I’ll admit I’ve been buying them more often lately so I can try out the bags in my composting projects. So far, they seem to be rotting right along — and they make handy holders for transporting other kitchen wastes out to the compost bin, where I simply toss the whole thing in. by converting consumer culture into compost culture. Granted, being in possession of compostable packaging means I’ve had to buy something to get it, but presumably, it was something I would’ve purchased anyway (except maybe an extra bag or two of chips). And it underscores the waste-reduction aspect of composting. Besides the yard wastes and kitchen scraps that we think of as natural ingredients to include in our compost piles, there are other by-products of our daily lives that might as easily wind up in the compost bin as in the trash can. Shredded newsprint or other uncoated paper (such as the letters that come in mail solicitations) can stand in for dried leaves in the compost heap, as can shredded cardboard. The gray cardboard tubes that support rolls of paper towels and toilet tissue will break down rather easily in a compost bin and also create tunnels to let air into the pile for a while until they collapse. A bin filled with biodegradable packaging is not likely to yield first-rate finished compost, any more than a diet of nothing but chips is likely to keep you in excellent health. But the occasional compostable bag or cornstarch-based utensil will simply add to your compost’s overall diversity, while the effects of your consumption will be balanced by the benefits of your compost-making. 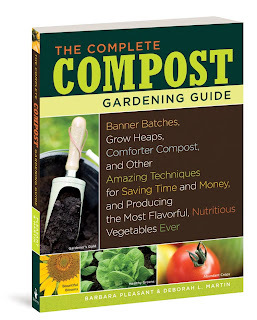 Deborah L. Martin is the author of Storey’s The Complete Compost Gardening Guide. Besides compost-making, her recent projects include The Organic Gardener’s Handbook of Natural Pest and Disease Control and Best-Ever Backyard Birding Tips. Deb practices the rotten art of composting in southeastern Pennsylvania. I like the idea of compostable "trash" like the chip bag and egg carton. I am now wondering if I can throw the coffee filter with the grinds into my compost bin. Every day I shake the grinds into a plastic pail and bring it out to the garden. In the process many of the grinds are lost — they stay stuck to the filter. For the record, the filters are non-bleached. Do you know if the coffee filters will compost? I compost my coffee filters and never have a problem. Thanks, Jamie, for the advice. I started putting the coffee grinds with the filters into my compost bin over the weekend. It definitely is much less messy that way!